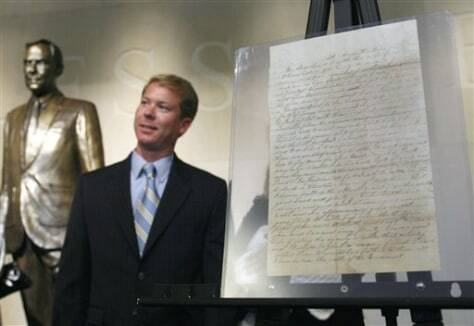 Ray Simpson is shown after a ceremony where the letter on the right, written by Davy Crockett to his children, was accepted by the State of Texas on Sept. 4. The state purchased, what is believed to be the last letter written by Crockett, for $490,000 from Simpson. Two experts question whether it's authentic.